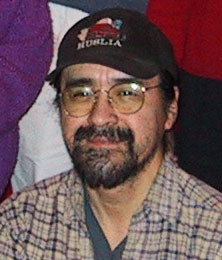 Orville Huntington, BS, was appointed to serve on the Alaska Native Science Commission in September 2000. Orville Huntington was born in Huslia, Alaska and received a B.S. in Wildlife Biology from University of Alaska, Fairbanks. Mr. Huntington is dedicated to working closely with young people to promote the values of traditional Native elders combined with contemporary western knowledge. He is committed to protecting the aboriginal rights of Native people to continue to live a subsistence way of life and preserve the cultural beliefs associated with that way of life as it is consistent with State and Federal law. Mr. Huntington currently works as a Refuge Information Technician at the Koyukuk/Nowitna NWR Complex and U.S. Fish and Wildlife Service. As a scientist he works closely with local village people in the villages of Kaltag, Nulato, Koyukuk, Galena, Ruby, Huslia and Hughes on subsistence surveys. Mr. Huntington has participated on many professional panels and testified at several State House and Senate Hearings. He currently sits on the following boards: K'oyitl'ots'ina Ltd., Brooks Range Contracting, Interior College, Interior Regional Housing Authority and Koyukuk Moose Hunter Working Group.